The OME-PIO-D24U provides 24 TTL digital I/O lines. The OME-PIO-D24U consists of three 8-bit bi-directional ports. The 8-bit ports are named port A (PA), port B (PB) and port C (PC). All ports are configured as inputs upon power-up or reset. The OME-PIO-D56U provides 24-bit bi-directional digital I/O, 16-bit digital inputs and 16-bit digital outputs. The 24-bit bi-directional digital I/O uses one 37-pin D-sub connector (CON3). The 16-bit digital I/O uses two 20-pin headers (digital inputs on CON2 and digital outputs on CON1). The 20-pin digital I/O headers can be extended to the PC slot window by using the OME-ADP- 20/PCI adaptor. The OME-PIO-D24U has one D-sub connector only. 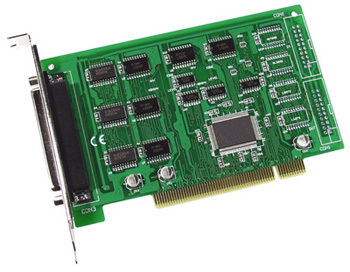 It can be installed in a 3.3 V or 5 V PCI bus and supports true "Plug & Play." All boards are supplied with a standard software development kit for Windows XP/Vista/7. The software development kit includes dll files for programming in C, C++ or other high- level languages and OCX files for Visual Basic or Active X programming. LabView drivers are also included. All boards include utility software and a complete user’s manual on CD-ROM.